If you were one of the many people who watched season one of The OA on Netflix, you probably recall your thoughts upon finishing the last episode. If you felt satisfied and entertained by the daffily earnest sci-fi story, then you’re in luck, because the new season is just as wide-eyed and fey as ever. But if you felt annoyed and put off by all the metaphysical hokum and New Age mysticism, you should consider this your official warning: In coming back for its second outing, the series is doubling down on everything strange and silly, and leaving any lingering questions of narrative skepticism far, far behind. In other words: Abandon all logic, ye who enter here. If the first season was as much about whether or not to embrace faith in something larger then yourself as it was a spooky tale of imprisonment and escape, this new installment jettisons those philosophical questions of belief and simply asks viewers to strap in for the ride. A willingness to set aside credulity and logical grounding is essential for this journey, even more so than in the original tale. Given it’s been two years since season one debuted on the streaming service (and found a surprisingly large audience for its weirdness), you could be forgiven for being foggy on the details—which is unfortunate, since even with a quick recap video to bring people up to speed, there’s a number of plot elements in the new episodes that tend to succeed or fail based on the extent to which you can remember things like the near-death experiences of the characters last time around. 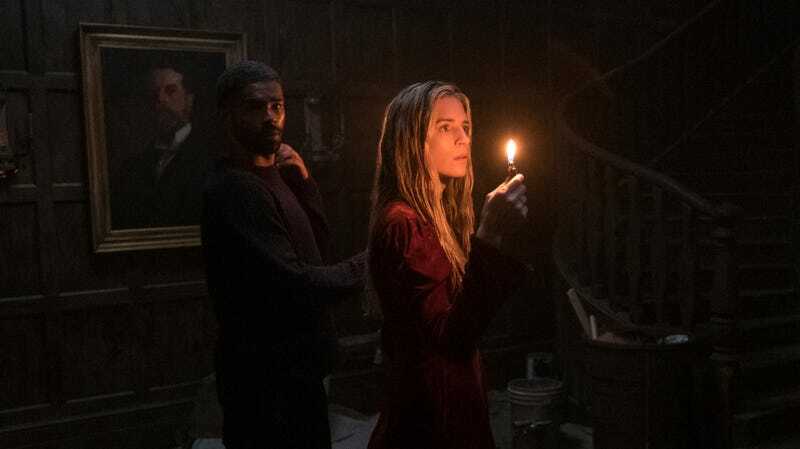 The first season of The OA, the brainchild of star Brit Marling and her director and co-writer Zal Batmanglij, followed Prairie (Marling), a blind woman who suddenly reappeared home after having been missing for seven years, her eyesight mysteriously restored. She gathered a coterie of outcasts to her, saying she is actually “the OA” and telling them the fantastical story of her underground imprisonment by a sadistic scientist, Dr. Hunter “Hap” Percy (Jason Isaacs), who killed and brought her and four other inmates back to life over and over, intent on learning the secrets of near-death experiences. She teaches her rapt followers a series of odd, modern-dance-esque movements she claims will open a portal to another dimension and allow her to save her friends, including her true love and former fellow prisoner Homer (Emory Cohen). After one of them uncovers a series of books suggesting she may have made the whole thing up as a means of dealing with the trauma of her kidnapping, the season ended with Prairie being felled by a school shooter as her five apostles execute the movements, allowing everyone else to be spared while her last moments leave the viewer to wonder if it was all a fantasy, or if she genuinely hopped dimensions. The smartest thing the new season (or “Part II” in the parlance of the series, not unlike Stranger Things’ “it’s a sequel, not a second season” nonsense) does is begin with a brand-new mystery, completely detached from all that’s come before. It’s a good one, too: Isolated private investigator Karim Washington (Kingsley Ben-Adir) is hired to locate a missing Bay Area teen who made a bundle in virtual cash from a strange app on her phone right before disappearing—an app Karim soon learns is actually a puzzle, one that eventually makes a strange jump into real life, with unknown consequences. Ben-Adir is magnetic in the role and the writing (by Marling and Batmanglij) strong, meaning you’re already caught up in the new thriller before we suddenly pivot back to Prairie, and the series dispels any lingering ambiguity: Prairie jumped dimensions, everything she said was true, and we realize that all those near-death experiences were actually the characters jumping into alternate realities, ones where their lives took very different paths. In this reality—the one in which Karim is looking for a missing girl—Prairie has leapt into the body of Nina Azarova (her original Russian name), a version of herself that never lost her sight and is living a posh life in San Francisco. Her mission is still the same—find and rescue Homer and her friends—but before you can can say, “I think I know where this is headed,” the connection between Prairie’s predicament and Karim’s case starts to become clear, and the two begin to overlap until their goals are one and the same. What makes the season a bit unwieldy is the show’s decision to try and return to all its original major characters, meaning in the third episode we’re suddenly back in the previous reality, rejoining those who helped Prairie cross dimensions: Steve, Buck, Jesse, Alfonso, and the teacher Betty Broderick-Allen, a.k.a. BBA (Phyllis Smith), who are trying to hold on to the belief in the OA’s story and their role in it despite doubts generated by the very real, very dead body of Prairie that continues to exist in their timeline. It’s not that more time with the characters is unwelcome, exactly—the third and sixth episodes are wholly spent in their dimension, with understated and elegant direction by guest helmer Andrew Haigh (Looking, Lean On Pete) that creates some lovely moments of character study—so much as the subplot feels messily tacked on to a narrative that already has a lot of new moving parts. It makes for abrupt pivots between the dimensions, and everything with the second group is rushed, especially a big shift in episode six that feels unearned. Besides, everything happening to Prairie and Karim is way more over-the-top bonkers, and often compelling. If you thought the first season got weird, you ain’t seen nothing yet. Prairie isn’t the only one who jumped into this dimension, and the ongoing struggle between her, Hap, and her friends remains the conflict around which all the drama swirls. But factor in a strange experiment recording collective dreams, an inter-dimensional traveler with surprising news about the group movements, and a large cephalopod, and you’ve got a series unafraid to go careening off the rails in the name of creative storytelling. Few shows require as massive a suspension of disbelief as The OA, but if you’re willing to go along for the anything-goes ride, there’s a visceral pleasure to be derived from its loopy charms. Not all of Marling and Batmanglij’s visually inventive diversions work—a number of the puzzles feel a bit like extraneous time-wasters, a paint-by-numbers approach to mystery which makes those sequences rote rather than riveting. It seems almost impossible the show could successfully land the many plates it gets spinning in the air by the end of the season (six of the eight episodes were provided in advance). Say what you will about season one, it had a clear beginning, middle, and end. By contrast, season two of The OA is both overstuffed and undercooked, a victim of its own commitment to expanding its universe in multifarious ways. Yet the performances are so solid, the commitment to its kooky worldview so earnest, and the smorgasbord of sci-fi curlicues so endearing, sacrificing your expectations of plausibility feels like a worthwhile price of admission to this odd little dimension of the TV universe.